Title: "Women on the verge" / "Horizon of holes"
Quasar is home, debriefing Epoch on his long time away. Epoch is interested in the Starbrand, which is something she's never heard of, and she's worried that it could unbalance the cosmos. 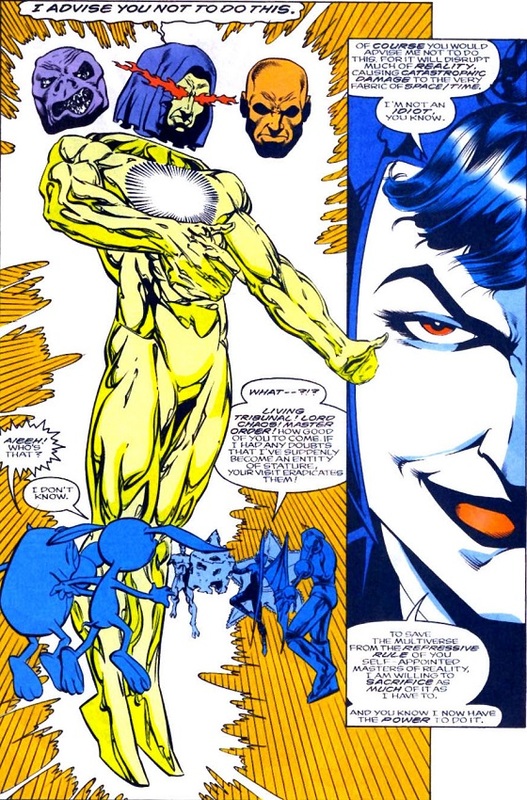 Quasar's Starbrand has "burned itself out" at this point, but we know that Kayla Ballantine still has hers. Quasar asks Epoch to search for Kayla, who is still not home. 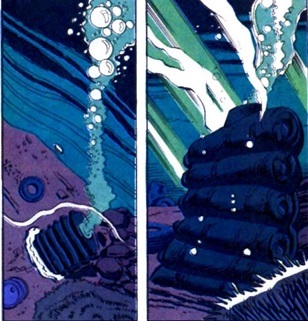 Quasar then thinks about re-connecting with Makkari and Kismet, but then realizes that he hasn't seen his mother in a while. He flies out to his hometown without checking his answering machine, and finds that she's not home. And that's because she's in the hospital, recovering from breast cancer surgery. He eventually finds out and goes to visit her. 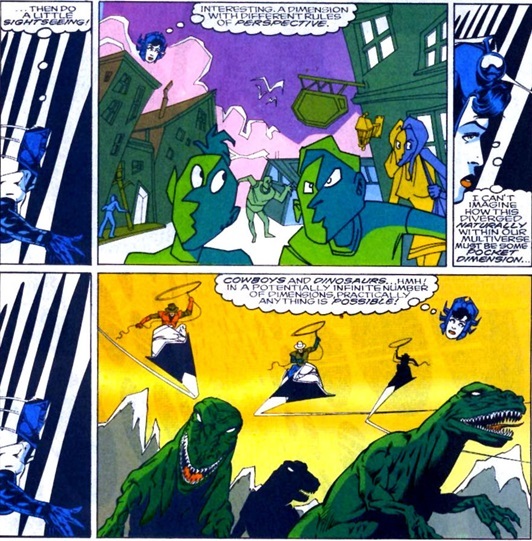 Quasar decides that he needs to do something about cancer, so he goes to Epoch, who he finds engaged at an alien university. Quasar learns that there is no cure for cancer anywhere in the universe. This is in line with what we learned in the Death of Captain Marvel graphic novel (and i am surprised Gruenwald didn't make a direct reference to that). It's a bit depressing to think that cancer has never been cured anywhere in the universe, though. For one thing, though, this seems to go further in scope (the CM story mentioned that the Kree and the Titans also had a kind of uncurable cancer). 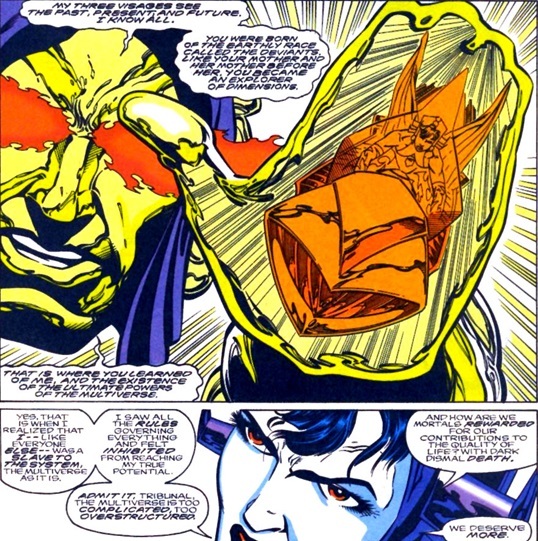 We also know that the Shi'ar had the ability to clone Professor X into a new body when he was infected with a Brood egg, and that seems like a promising way to deal with cancer. It's of course necessary for there to be no cure for cancer, but i'd rather it was suggested that it was a uniquely Kree & human disease than to say that it exists among all alien species and no cure has ever been found. Anyway, Quasar goes to the Elder of the Universe known as the Caretaker next, but since his mom isn't "a cosmologically significant entity", she can't help. 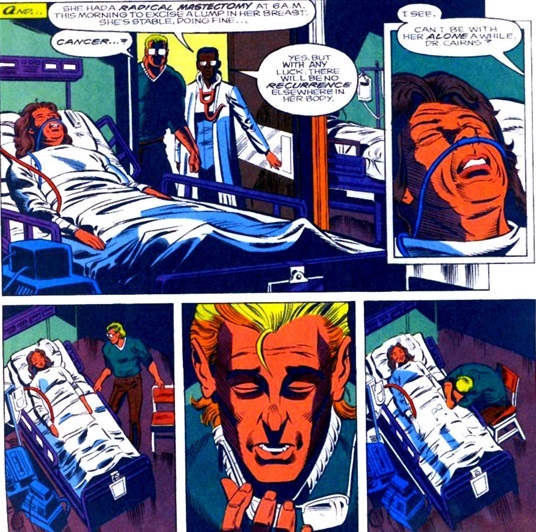 Quasar then goes so far as to challenge Death herself before realizing that he's lost control and returning to wait by his mom's bedside. Meanwhile, Kayla and her companion H.D. Steckley arrive at Kayla's father's house so that Kayla can get some clothes. Her father gives her the drunken-bum riot act, and Kayla instinctively uses her Starbrand power to toss him across the room when he lays a hand on her. 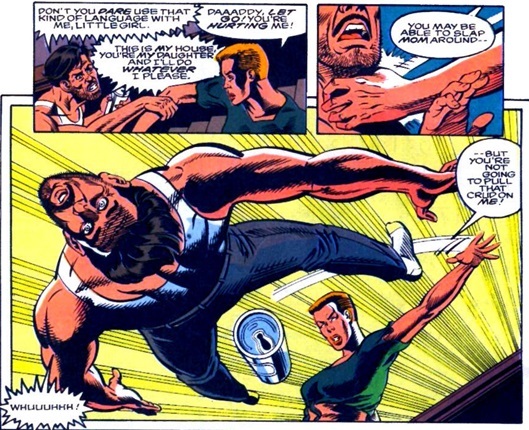 It makes me think of the Justice story in New Warriors, but Kayla's father doesn't seem to be badly hurt. Kayla realizes her mistake and says that she needs to get rid of her powers. She then grabs some sweat clothes (in a drawer presumably not opened since the Flashdance craze of 1983) and leaves. Meanwhile, Kismet returns to Earth and detects the Starbrand, recognizing it as the same energy signal she felt on planet Scadam. It leads her to Kayla, who is in H.D. 's apartment. Kismet singlemindedly interrogates Kayla about the Starbrand while Kayla tries to get Kismet out of H.D. 's apartment, and eventually knocks her out the window. Since Kismet is really just trying to ask Kayla questions and Kayla is just lashing out, Kismet decides that she's "mentally unstable" and that it's dangerous for her to harness the powers she's using. They continue to fight, but Kismet is wounded and she's forced to sink to the bottom of the bay to repair herself in a cocoon. They were fighting near the Statue of Liberty, so i don't think Kismet lands in Jamaica Bay where Jean Grey spent years in a similar looking cocoon. Kayla returns to H.D., upset that she's once again used too much power. H.D. again tries to convince Kayla to give her the Starbrand, and this time Kayla agrees. And then H.D. reveals that she's really (did you guess?)... Erishkigal! Of course you didn't guess. Erishkigal is a random Deviant that appeared in one story over a decade ago. She has no connection to this book, and there were no hints that this is who she was. 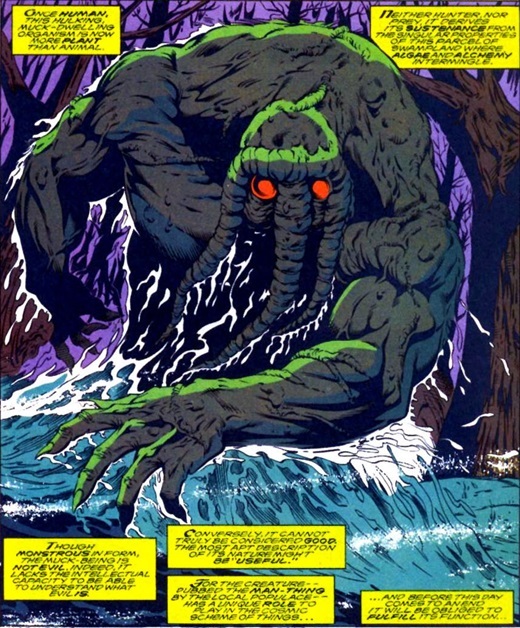 Erishkigal's acquisition of the Starbrand causes the Nexus of Realities in the Everglades to open, alarming (so to speak) the Man-Thing and a number of the world's mystics. Erishkigal overtly informs us that she's not evil, just "motivated in a very egocentric manner" and then flies off to the Nexus. She beheads the poor Man-Thing when she arrives, and then goes through. 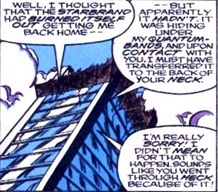 Meanwhile, Quasar's mom is given a relatively ok bill of health (she'll still have to do chemo, but it's said that there's a low likelihood of re-occurrence), so he heads back to New York to find Kayla (Epoch had told him that she was back on Earth). He finds her at his old office talking to Kenjiro Tanaka about Erishkigal. Qusar checks on Kismet's cocoon to be sure that she's "ok" and then takes Kayla with him on the trail of Erishkigal. Erishkigal is using the Nexus to peek into a couple of bizarre dimensions. We're told that the Nexus that the Man-Thing guards is actually only one of several in our universe, and Erishkigal's invasion attracts the attention of the Silver Surfer, who goes to another such Nexus. I don't really love the idea of there being multiple nexuses (nexi?) in the same universe. It also seems to be the case that the other nexuses have guardians that are more explicit in their duties than the Man-Thing was. But also more awesomely hilarious. Erishkigal's goal is to claim the "Nexus Interzone" for her own. She's challenged by a number of guardians. The Ren & Stimpy clones make me wonder if the idea is that some of these characters are from Marvel's other non-Marvel universe publishing lines, the implication being that they are all part of the multiverse. That wouldn't make a lot of sense, since Ren & Stimpy are surely at least as far away from the Marvel Universe as the New Universe, and the whole idea of the Starbrand is that it's out of place in this multiverse. 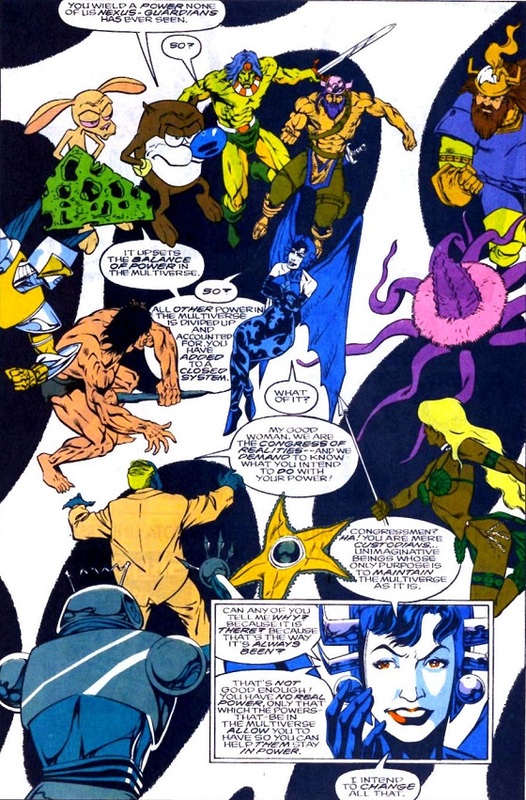 I'm not sure if any of the other guardians are meant to be anything specific (one looks like DC's Starro, the robot guy is arguably a Robocop analogue, and the yellow guy with the sword is bugging me for some reason like i should know who he is). 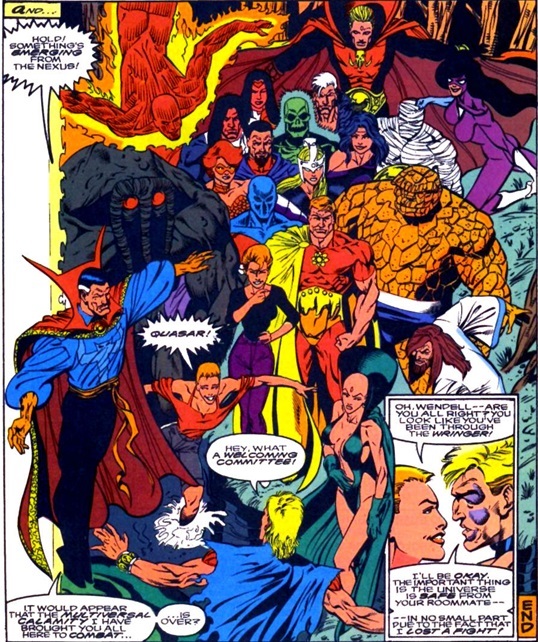 None of these characters look like the Nexus crazies seen in Man-Thing #1, for what it's worth. Erishkigal is able to make a kind of populist appeal to the guardians, saying that they've been forced to enforce a status quo that doesn't benefit them, and she's going to change it. She convinces some and blasts away the others. 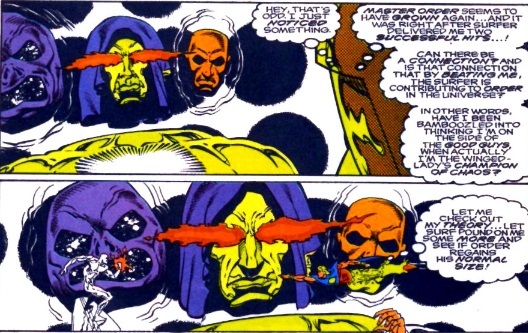 Then the Living Tribunal appears with Lord Chaos and Master Order. 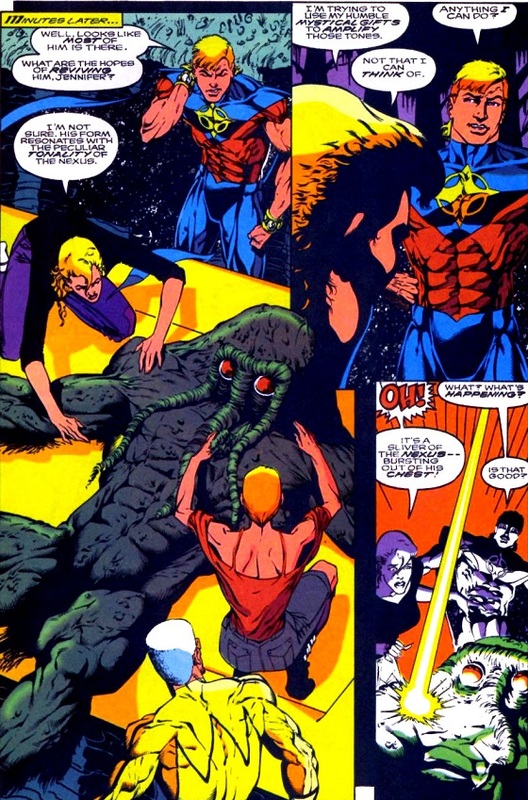 Meanwhile, Quasar finds Jennifer Kale trying to repair the Man-Thing. 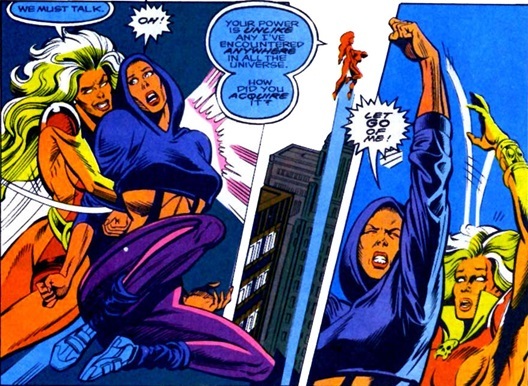 Quasar leaves Kayla with Jennifer (and Kayla of course immediately starts worrying that Jennifer is an old girlfriend). 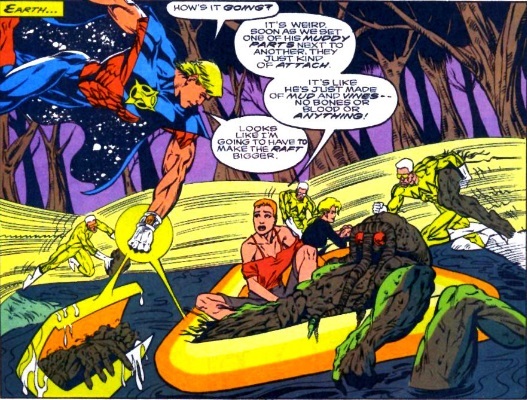 Quasar tries to fly through the Nexus, but it fades away so he just ends up flying down the swamp and would have crashed into a tree but for the arrival of the Whizzer (sent by Arcanna, one of the mystics that detected the problem). They return to the Nexus site and help repair the Man-Thing. When that's completed, a sliver of the Nexus bursts out of the Man-Thing's chest. It's enough for Quasar to get through. The Silver Surfer also manages to get through his Nexus, although we get to see exactly how he bypasses his guardian. 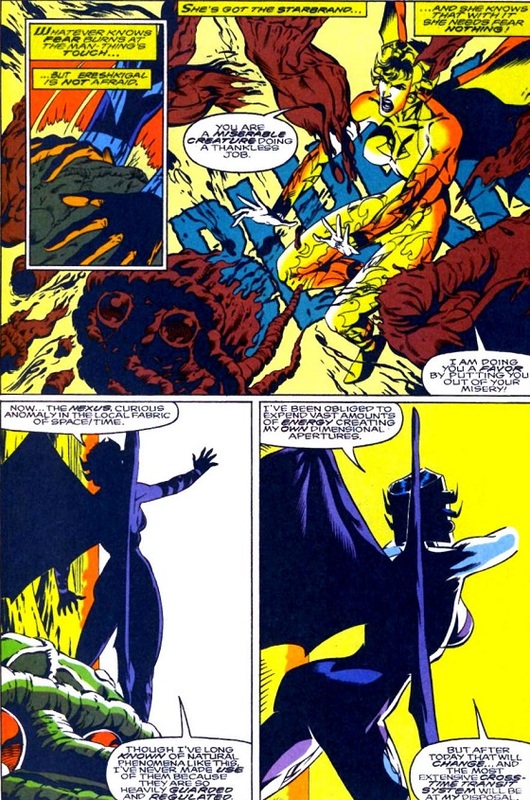 They both arrive as Erishkigal is continuing her populist agenda against the Living Tribunal, saying that mortals "deserve more" than what they are allotted by the cosmic entities. I like this as an angle for a villain, better than her just being "motivated in a very egocentric manner". But it doesn't get explored. The Living Tribunal says that he acknowledges Erishkigal as a powerful being but says that she could not withstand his unleashed power. 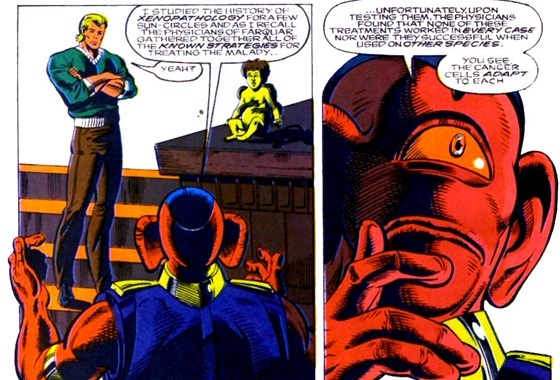 He then suggests a contest to determine whether or not she'll give up the Starbrand. 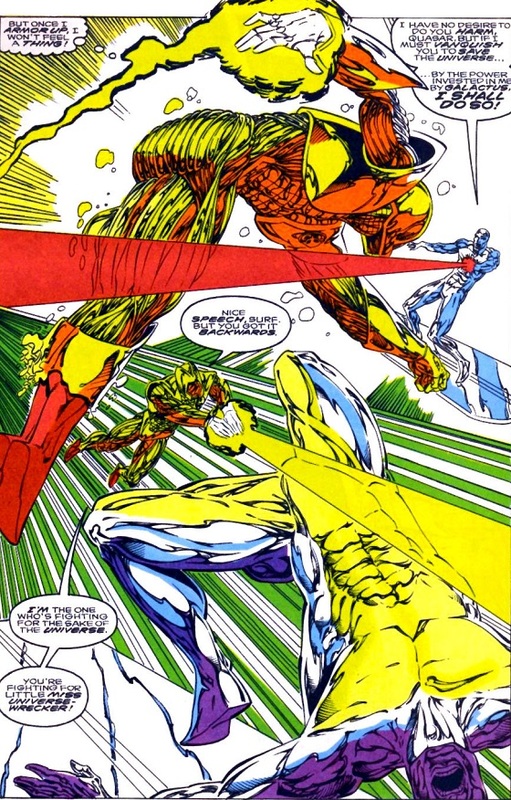 Quasar and the Silver Surfer will fight, each representing a side in the conflict without knowing who represents who. Erishkigal agrees. We don't find out who she picks as her champion, and both Quasar and the Surfer are made to believe that they are fighting for the Tribunal. 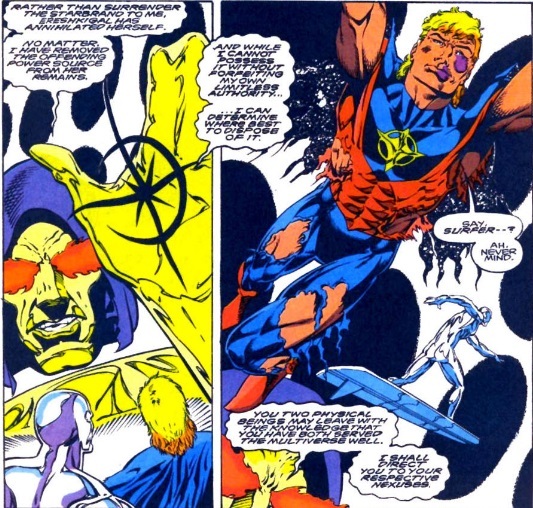 But Quasar notices that each time he hits the Surfer, Lord Chaos gets bigger, while when he gets hit the reverse is true. So he reasons that the Surfer is actually on the side of "good" (or at least order). And he therefore throws the fight. Erishkigal abides by the agreement, although instead of just handing over the Starbrand, she destroys herself. When he returns to Earth, he finds that Dr. Strange has assembled a cast all ready for the Infinity Nexus 40-part crossover, but fortunately it's not necessary. I think it's cute that the villain for issue #50 turns out to be based not on any story elements but just on the most obscure possible character one can think of. But it's a weird payoff for a character that has been a mystery for almost two years (not to mention the fact that she was using a fake identity first used by a completely unrelated character). However, it's totally appropriate for a big issue #50 story to involve strange multiverse characters, and the ending is a nice change of pace compared to a normal big fight, even if i think something more should have been given to explain why the "egocentric" Erishkigal would abide by the terms of the contest if she lost. Chronological Placement Considerations: Last arc had to get pushed back in publication time due to reasons ultimately related to Dr. 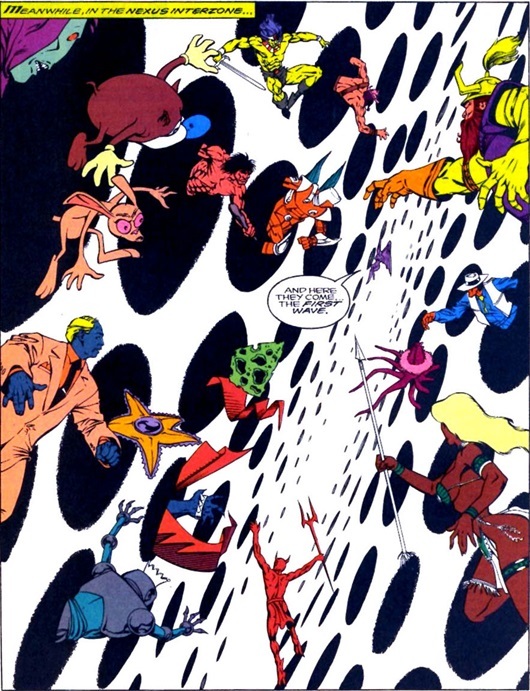 Strange still having his full powers in New Warriors #32-34. The Kayla subplot - which has been causing continuity discomfort for me for a long time now - seems to continue almost directly from the last arc. At the beginning of issue #49, Kayla is wearing the same torn-up clothes that she was wearing at the truck stop in issue #48. So this should take place soon after the last arc. The large number of guest stars in this arc make pushing all of this back in publication time risky, but it seems to be ok. It's not clear of Dr. Strange has his full powers or not. The Thing isn't wearing a helmet (or scarred) but that's a common handwave by this point (image inducer). And in general the characters who appear at the end don't say or do anything. The trickiest appearance is probably Modred the Mystic, who is potentially trapped in Maui at this point. But when we see his headshot at the beginning, it's not clear where he is. And when he appears at the end, he's with Dr. Strange, the guy who trapped him, so if necessary we could argue that he's been allowed out just for this (perceived) crisis. Similarly, there's not enough seen with Shaman to worry about whether he's supposed to be with Alpha Flight at this point or not. This does have to take place after Adam Warlock wakes up from his coma in Warlock and the Infinity Watch #14-15. ...but looks under repair a few pages later. The state of the FF's building is, like the Thing's face, something that is depicted inconsistently throughout this year, and the fact that it's seemingly inconsistent in a single issue is actually helpful. Maybe the damage is only visible from certain angles, or maybe there's an image inducer that fades when you get close enough. The next arc continues more or less directly (but it's a separate story that i'll place in a separate entry). 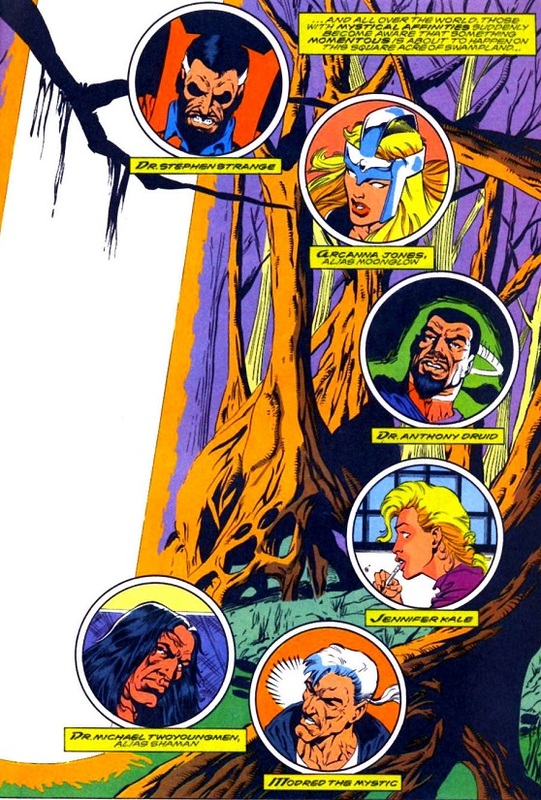 Quasar thinks to himself that he left Makkari and Kismet "well over a month ago" in Quasar #37. 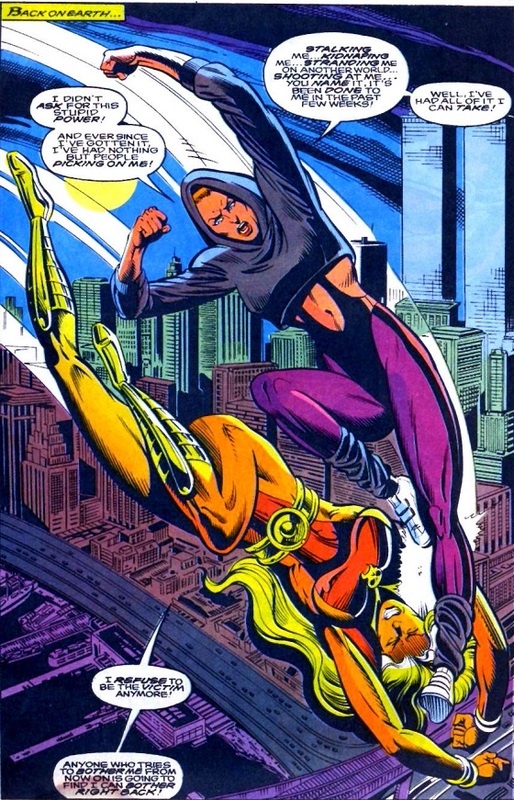 Kayla met Kismet/Her in Quasar #30 which also happens to be the issue where Erishkigal first starting posing as H.D.. And that's also the story where Quasar brought the Starbrand to Earth. 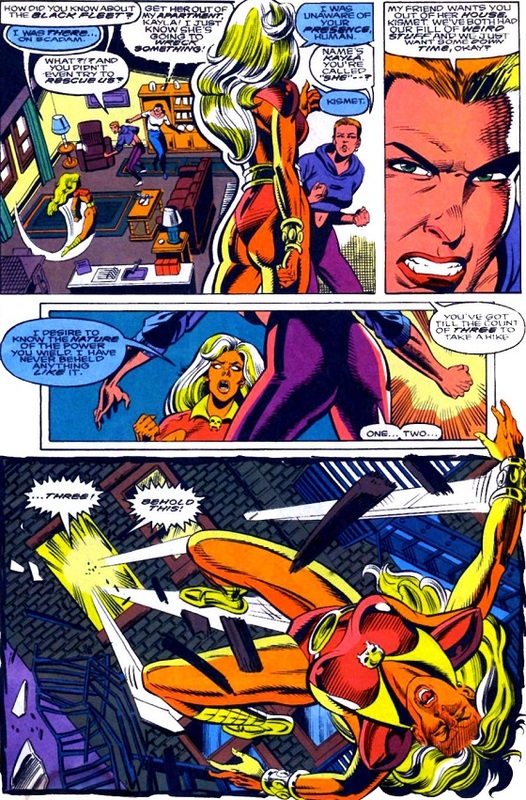 Quasar met Jennifer Kale in Marvel Comics Presents #29. He doesn't recognize her at first here because her hair has changed (it looks more like how she appeared in Legion of Night. Ren & Stimpy are guardians of the Nexus of Realities? Happy happy joy joy! I had absolutely no idea who H.D. Mk II was going to turn out to be while reading these reviews. The seemingly-incongruous tag for Erishkigal the last twenty (!) issues probably should have clued me in, or at least been more of a clue than Gru gave. I wonder if someone told him Maelstrom was too easy to guess, so he made the next mystery villain virtually un-guessable. The cyclops-alien appears to be a Megan, an alien race that appeared in some of the better Godzilla issues. I see Spawn's cape and glove coming out of one of the negus holes, and one of Sleepwalker's people in the upper left. Surprised the artist didn't have more fun with that scene. Looks like Wendell used the X-O Manowar armor during his fight with the Surfer. The yellow guy with the sword strongly resembles John Blackstar from the early 80s Filmation cartoon and Galoob toy line. I think another one of the guardians is, um, a giant green wedge of Swiss cheese?!? 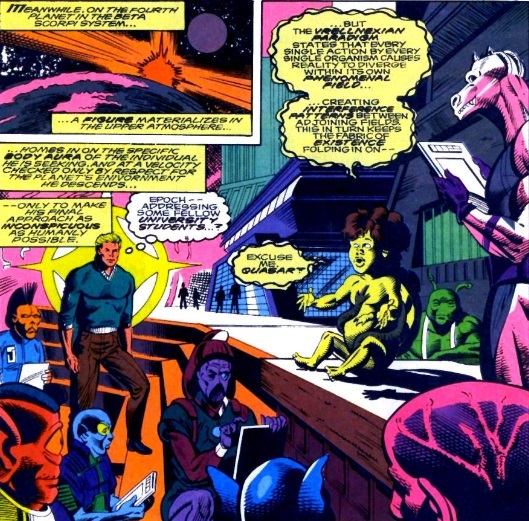 Note that the Guardians are referred to as the Congress of Realities, the same name as Thog's minions in Fear 19 and Man-Thing 1. Are they supposed to be the same organization? Their scheme was also centered on the Nexus of Reality. The non-Moondragon HD Steckley shows up the issue before Quasar gets the Starbrand. Is it explained why Erishkigal would infiltrate Quasar's company at that point? I should have checked the Appendix, which tells me "Her initial plan was to somehow steal Quasar's Quantum Bands, but after she detected the power of the Star Brand (from the "New Universe"), she set her [sights] on it instead..."